To celebrate the company’s 87th anniversary, 7-Eleven is giving away free small (12 ounce) Slurpees from 11 a.m. to 7 p.m. on Friday, July 11, which is 7-11. “Free Slurpee Day” began in 2002 and has happened each year on 7/11. THis year, they’re giving away more free snacks to anyone willing to download the store’s app. June 7, 2013, is national doughnut day. Started by the Salvation Army on June 7, 1938, National Doughnut Day was originally a means by which to raise money for charitable efforts during the Great Depression. The sweet holiday specifically honored female volunteers in World War I, commonly referred to as “lassies,” who provided logistical support to the troops on the front lines, serving them hot food and of course doughnuts to keep up morale. Flash forward to 2013 and we no longer have “lassies” providing doughnuts to boost morale on the front lines, but doughnut retailers across the country have taken this day as a way to give out free doughnut samples and entice us to enjoy more of their sugary goodness. On Tuesday, May 10 from 4:00 pm – 7:00 pm, enjoy a complimentary 12 oz. Ice Blended drink at Coffee Bean & Tea Leaf. Rich complex chocolate with balanced expresso notes and a creamy mint finish. Sweet & creamy with decadent chocolate cookie and vanilla cream notes. Rich, bold expresso flavor, creamy and smooth, balanced with just the right amount of sweetness. Don’t miss out on your chance to get two free tacos at Jack in the Box on Tuesday, November 16, 2010 after 2:00 pm. 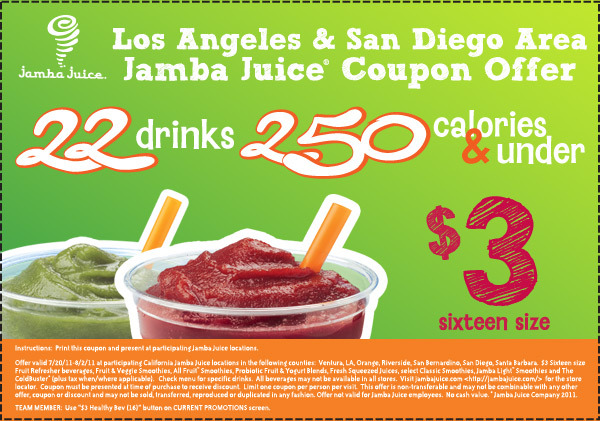 This offer is valid at participating restaurants only, no coupon or purchase necessary. One offer per person. While supplies last.